Fly fishing is a wonderful hobby to take up. You get to relax in natural surrounding and in peace and quiet while casually flicking your line into the water. For many it is simply this act that drives them out to the lakes, however, for others the thrill of taking home a catch is what its all about. Fly fishing is a continuous learning opportunity. The foam holds vital indicators that would otherwise be unknown. Foam will indicate the flow lines. If the flow is moving the foam, it is moving the food. Foam around the rock is always a good place to cast your line. Keep abreast of any issues with your drift by keeping a watchful eye on the foam. Your line should never be moving far ahead of the foam. Regularly check your fly. They are finicky items and can be moved out of place in an instant. Every time you catch a fish, or lose one, take time to inspect your fly and make the necessary adjustments. Adding a floatant to the exterior of the fly will ensure that the fly floats like a cork. Too much floatant will prevent your fly from riding correctly. Take a systematic approach to where you fish. This is particularly important in areas where no properly defined holding areas are present. 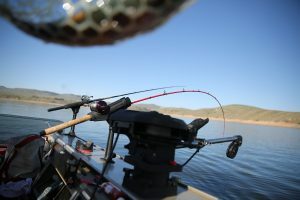 By taking this approach, you are sure to cover every area of the lake and you will find the fish if they are there. Where casting is concerned, there are many factors that could impact your fishing experience. Always find the best position to cast and never cast into a rise. Not all casts will go according to your plans but regardless of if it is perfect, let it lie. Enjoy the fishing to the fullest.